We stayed clear of Black Friday especially since Engineer and I had been popping every possible homeopathic and OTC remedy for colds all week (we weren't taking any chances.) We pulled out the Christmas stuff, started replacing the everyday with the festive, and we tore the house up looking for my Christmas planner. Oh yeah, and we were still finishing the hand washing from Thanksgiving. Saturday, we continued on the hand washing and the Christmas house rejuvenation (and found my Christmas planner) before heading out to see The Charlie Daniels Band in concert. It was a good concert and his band is fantastic! I didn't realize that they did instrumental tunes as well and actually, they were my favorite pieces...except for "The Devil Went Down to Georgia" of course. We had been trying to get together with some folks for ages and finally it happened Sunday. We went out to eat after church and then they came back for coffee and to let the girls play. From there, we attended our church's annual Hanging of the Green service which is so beautiful then had our Pastor and his wife over. And at some stolen moment during the day, some invites for an upcoming charity tea were designed. So here it is Monday and it is all systems go with the neglected laundry, replenishing my gravely depleted pre-baked freezer goodies, and writing blog posts. 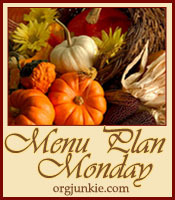 This is part of the wonderful institution that is Menu Plan Monday over at Organizing Junkie.